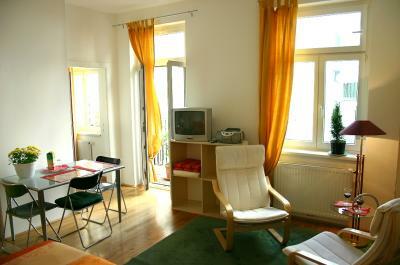 We offer studio-apartments in a small intimate house situated in a very quiet romantic courtyard - off street. 2 minute walking distance to the 1st district of Vienna with the famous Ringstra�e, University, Town Hall (X-mas Market, Viennese Festival), Votivkirche and Viennas General Hospital associated with the Medical University of Vienna. Just opposite the house you will find the University Campus and the National Bank-Building. There are lots of shopping facilities as well as an Internet-Caf� in a distance of 50 metres. The house and the apartments are newly built. Each apartment is 33 square metres consisting of one room with a small kitchen line, spacious bathroom and hallway. The rooms are 3 metres high. Each apartment is suitable for 1 to max. 2 persons.